Cream, butter, Parmesan cheese, a little pepper and a dash of nutmeg: Alfredo sauce is a fairly simple recipe that requires just a few primary ingredients. That’s one reason people love it. The other? It tastes fantastic. Traditional Alfredo sauce is a delicious combination of fats and oils, but unfortunately, it’s also loaded with fat and calories and is a real artery clogger. As consumers demand healthier food options and try to cut back on fat-laden creamy sauces, manufacturers are eager to find ingredients that provide the tastes and textures they love without all the fat and calories. A major challenge for food manufacturers is improving nutrition while maintaining clean labels and meeting the demand for natural ingredients combined with great flavor. After all, more than 60% of Americans consider the healthfulness of a product as a key driver in their purchasing decisions and want to cut back on fat and calories, but taste still remains at the top with 81% saying it's their number one consideration. At the same time, consumers are also drawn to convenient products that fit within the average food budget, adding another layer of difficulty to the manufacturing process. 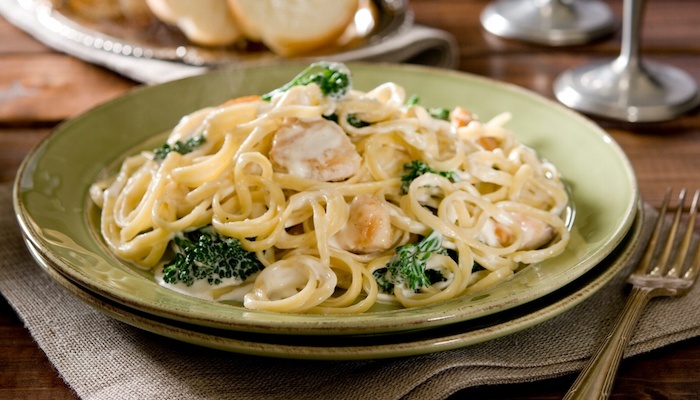 Using Alfredo sauce as an example, one of the biggest challenges for manufacturers is decreasing the main contributor of fat in the formulation—cream. Cream provides the attributes that give the sauce its signature flavor, texture and mouthfeel, and if those characteristics can’t be accurately replicated in the cream replacement, the healthier Alfredo option won’t satisfy consumers—and won’t sell on the shelf. According to the Code of Federal Regulations Title 21, heavy cream must be composed of 36% or more of milkfat. Milkfat provides the distinct creamy mouthfeel and texture that’s so appealing in cream-based sauces, and also contributes to the dairy/cream flavor. Replicating those characteristics and creating the appropriate viscosity—not too thick, not too thin—is a common challenge among manufacturers, especially those thinking they have to rely on commodity whey or gums and stabilizers when trying to achieve the right milkfat characteristics. So, where does a manufacturer turn when consumer demand calls for all the taste and clean labels, but not all the fat? By formulating with all-natural functional whey protein ingredients, like Grande Bravo®, food manufacturers can replace high-fat, high-calorie dairy ingredients like cream, butter, milk, and cheese in applications. This is perfect for creamy sauces like Alfredo, as Grande Bravo provides a unique water-holding capability that helps replicate the same texture and mouthfeel as the original formulation with a clean flavor profile—and often at a lower cost. To learn more about how functional whey protein can help food manufacturers reduce the fat and calories in their creamy sauce applications, without compromising texture or mouthfeel, read our helpful guide, How to Improve Your Food Product’s Quality - While Reducing Costs. Just click below to access.